– I ALWAYS lay out in the grass and read during the summer because I can get tan (or sunburn) and enjoy myself while doing it. – I just so happen to work at this coffee shop, so they can’t really kick me out. I go in after school sometimes and just read after I’m finished with my homework. – This one isn’t in a very specific location, but I usually read when I am stretching before and after dance class. I sit in my straddle splits and lay as far forward as I can and dive into the story. It also helps take your mind off the pain of the muscles. What are some of your favorite reading places? Do you have any weird places you find comfy? No this is not the best quality photo, but look at how gorgeous this is. 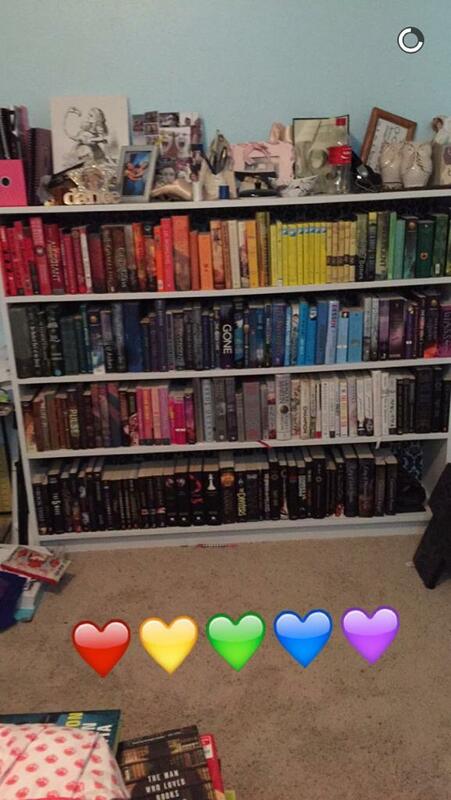 I reorganized my bookshelf by color, obviously. It is one of the most wonderful things I’ve ever done to my room and I definitely recommend it. I have never ever wanted to do this because the series would be out of order, I wouldn’t know where the books were, etc. etc. But, this is one of the prettiest things in my room! I have almost 200 books in this shelf, and I’ve read 92 of them. I have my TBR, roughly, down to 108ish. That is super cool for me because if I hadn’t have gotten rid of all the books I did whilst organizing this shelf, I would have been more overwhelmed with my TBR list. Getting to the point of this post. I have always felt so bad by how many books I had and had not read. I bought them and just never got around to reading them for various reasons, then just didn’t want to anymore. I felt so bad about not wanting to read books I’d had for so long, so I tried forcing myself to read it, and it made me want to hurt myself! My word of advice: it is okay to not want to read a book, don’t force yourself to! I just went through all of my books the other night and got rid of 62 that I just had no interest in. 62 books that I didn’t want to read. Granted I am on the end of this where I knew I had too many books, but I got 62 off my TBR because I got sick of them sitting on my shelves. I had read some of them, so the 62 is a little of an exaggeration to the TBR list, but I don’t have that burden of having books I didn’t care to read. Do a book purge! I feel so much better about the books that I have now, because I want to read every single one. There isn’t a single book on my shelf that I would say no to reading. Many of you probably feel the same feeling I had felt by the huge TBR you have. If you don’t want to read them, get rid of them. Sell them to a used book store, give them to friends, leave them in a coffee shop. That being said, I love books and always will. I’m not saying to get rid of books you’ve read because you feel like you don’t want the clutter, but if you feel like doing so, have at it! They’re your books, don’t let them control you ;). For as long as she can remember, Clare and her family have had a dream: Someday Clare will be a dancer in City Ballet Company. For ten long years Clare has been taking ballet lessons, watching what she eats, giving up friends and a social life, and practicing until her feet bleed — all for the sake of that dream. And now, with the audition for City Ballet Company right around the corner, the dream feels so close. But what if the dream doesn’t come true? The competition for the sixteen spots in the company is fierce, and many won’t make it. Talent, dedication, body shape, size — everything will influence the outcome. Clare’s grandfather says she is already a great dancer, but does she really have what it takes to make it into the company? And if not, then what? Told through passionate and affecting poems in Clare’s own voice, On Pointe soars with emotion as it explores what it means to reach for a dream — and the way that dreams can change as quickly and suddenly as do our lives. Clare has dreamed of being a ballerina her whole life. She’s taken classes in order to get better; she’s gone through countless pairs of pointe shoes and has had more blisters than she thought possible. Her dream is shared by classmates in her dance lessons. The girls are told they have to look a certain way, weigh a specific amount, love to dance. It’s a hard life to live and an even harder legacy to live up to. Clare lives with her grandfather so she can be closer to the dance studio. 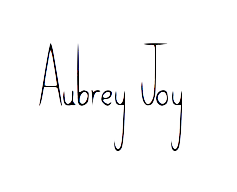 Her parents support her money-wise in her endeavor to learn ballet. Clare goes through hours of ballet classes every day to finally get told she’s not good enough. She shuts down and stops taking class. A family tragedy takes priority over ballet and she ends up telling her mom off for being too attached. Clare wants to dance, but is thinking a different route than being a professional. Is that even possible for her? I love books in verse because they are so fast and easy to read. This was not what I was expecting at all. The dancing wasn’t really even part of the story. 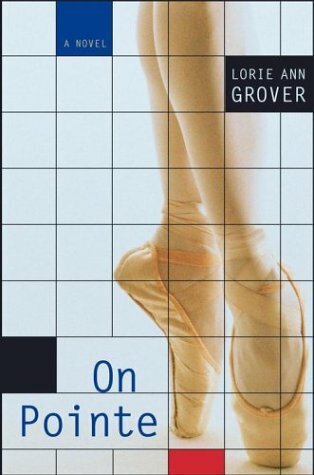 I don’t think the author was a dance because she called ‘pointe shoes’ ‘toe shoes.’ Nope. Not the same thing. I was bothered because it wasn’t driven by the dance aspect. I have yet to find a really great book about ballerinas. I want to be a ballerina, so a lot of the things that I’ve read about in fiction books are very… unrealistic. The competition is hard and there is a very small chance of actually becoming a dancer. Most people don’t even realize that. Dancing professionally is so hard on your body, and you don’t really always have a guaranteed spot. I understand that because this book wasn’t very ballet oriented, that it appealed to many different groups of people, but I would love to find a really great ballet book. I would choose to be Clare. Mostly because she was the only character, but she was a pretty cool person. She did end up dancing because she wanted to, and not just because her parents told her to. She was a very strong person who didn’t give up completely. It was nice to have a character break down a little bit and feel lost. Some books are really unrealistic in the fact that they have the main character always knowing what to do; that isn’t real life. There are point(e)s where you have no idea what to do. It was nice to see that vulnerability from Clare.